Around 20 activists held a silent protest today, from noon to 1pm, in front of the Sayyeda Zeinab Police station in Cairo, marking the International Day Against Torture. The silent protest was arranged through the word of mouth for security concerns. Anti-torture activists wanted to "surprise" the police, fearing a ban. There were Lawyers and activists, from Kefaya, the Egyptian Association Against Torture, and the Arabic Human Rights Information Network. Central Security Forces did not show up, and the usual friendly faces of State Security's CounterCommunism Bureau officers could not be seen There were just police officers from the police station, plain clothes security, as activists stood silently carrying banners denouncing torture. It seemed like the security was in no mood for cracking down, especially when the demo was small. Citizens passing by in the busy Sayyeda Zeinab square were usually asked by the police to stay away, whenever they approached the demonstrators or stopped to read the signs. But there wasn't the usual violence and thuggery. Three veiled teenagers stopped for few seconds in front of a banner, with a picture of a detainee stepped over by an officer's boot. One asked, "Is this Iraq?" The other replied, "No it's Egypt!" The third remained silent, as the first said after another quick look at the banner, "Hmhmhmm, it looks like Iraq wallahi." Another man in his 50s stopped in front of the protestors, skimmed through the signs, then nodded his head, saying "God bless you. God bless you." He kept on repeating that, as he circled around the protestors for a minute. The most interesting quote from a passer by I heard was: "You won't achieve anything," shouted a veiled woman, wearing sunglasses, with her two little daughters around her. "You should leave now before they arrest you. They hit the judges. Don't you think they'll hit you too?" A plain clothes security officer approached the protestors around 12:40, asking them to leave saying "you do not have a license for this demo." Activists 3aida Seif al-Dawla, Magda Adly, Laila Soueif, and Gamal 3eid got into a discussion with the officer, arguing his interior ministry never gives those licenses to anybody, and asserting their right to stand silently and peacefully. The discussion went on for five minutes, and the officer did not seem in a confrontationalist mood. He decided to let it go, after the activists told him their one-hour protest was coming to an end in 15 mins, and that there were "no need for further scandals." And indeed, the whole thing was over by 1pm. I took a cab to Zamalek, where I was supposed to have coffee with 3alaa and few other friends. The cab drove through Lazoughli Sq, where the Interior Ministry's compound (that includes State Security HQ) is located. Last year, the anti-torture demo was held for the first time in that square. I couldn't believe it then, as I attended the event to report on it. If that had happened in 1990s, or anytime till 2004, it would have been a suicide. No street demos were allowed, let alone one in Lazoughli! The demo today was away from Lazoughli, but still in the street. It's up to you to determine whether today's demo's location signifies "retreat," since no one dared to be close to Lazoughli, or a "progression" when you compare the situation to the 1990s? Hereâ€™s a dpa report by my friend Jano Charbel. Good story, except I think there were no more than 20 activists present. Cairo (dpa) â€“ Around 50 lawyers and human rights activists staged a silent demonstration in front of Cairo's al-Sayyeda Zeinab Police Station on Monday in commemoration of the International Day in Support of Victims of Torture â€“ which is commemorated on June 26 of each year. 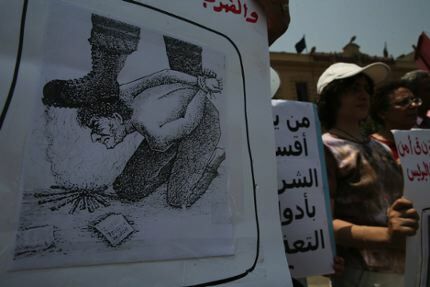 The demonstration was organized by the Egyptian Association Against Torture, an umbrella human rights grouping comprising four local human rights organizations along with independent rights activists. Around a dozen members of the left-leaning opposition umbrella movement, Kifaya/Enough, were also in attendance. The Association chose to hold its demonstration at the al-Sayyeda Zeinab Police Station as it has a notorious record for torture and cruel and degrading treatment of suspects. Tens of human rights activists held up banners and posters reading "torture is a crime against which we will not keep silent" and "torture is a systematic and routine procedure in Egyptian police stations." 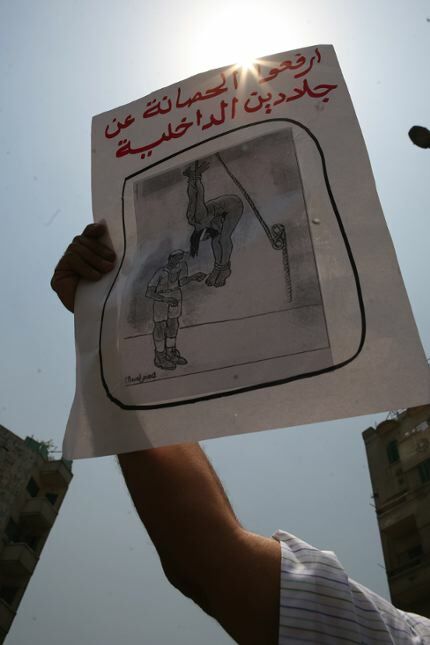 Other activists held up drawings, sketches, and photographs of torture techniques commonly utilized in Egyptian prisons and police stations. Lawyer Gamal Eid, the Director of the regional Arab Network for Human Rights Information â€“ one of the four constituent organizations under the Egyptian Association Against Torture - told Deutsche Presse-Agentur dpa that "we could have staged this demonstration in front of any Egyptian police station since torture and physical abuse are conducted in nearly every police station throughout the country." Eid added "we chose al-Sayyed Zeinab Police Station, however, as it is one of the most notorious torture centers in Cairo." He went on to say that "we had staged a demonstration on June 26, 2005 in front of Cairo's Lazoghli State Security Headquarters as torture takes place on a daily basis in this fortress." "We also held other demonstrations, that did not coincide with the International Day in Support of Victims of Torture, on occasions when blatant acts of torture were perpetrated." "One demonstration was staged in front of the infamous Gaber Ibn Hayan State Security Headquarters in Giza earlier this year due to its dreadful record of human rights violations," said Eid. 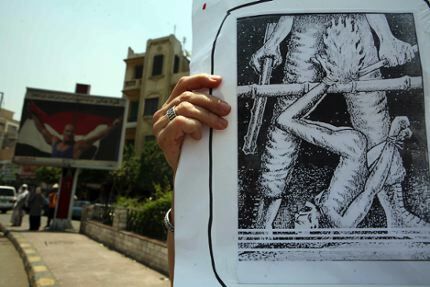 "Another demonstration was held on June 1, in front of the Qasr el-Nile Police Station in downtown Cairo following the May 25 th arrest of Kifaya activist Mohammad el-Sharqawi who was beaten, physically tortured, and sexually abused on the same day at this police station." Eid added "we human rights lawyers and activists are attempting to expose the violations of the Egyptian government â€“ especially the ministry of interior â€“ as the authorities are doing nothing to curtail the perpetration of torture in detention centers and police stations." "Egypt had ratified a number of international human rights instruments relating to torture, yet has failed to implement them. The Egyptian government ratified the International Convention Against Torture nearly 20 years ago yet it does not uphold the rights stipulated within this convention, nor does it even respect its own domestic laws prohibiting torture." During today's demonstration around twenty officers from the al-Sayyeda Police Station and state security officers monitored the events from the sidewalk facing the demonstrators. No arrests were made, although one officer unsuccessfully attempted to persuade the protestors to disperse. Ahmad el-Droubi, a Kifaya youth activist recently released from prison, told dpa, "this was the first clandestine surprise demonstration to be held this year." He indicated that the organizers chose not to publicly announce this event as all demonstrations have been banned since the renewal and re-imposition of the emergency law on April 29. El-Droubi added "we did not announce the staging of this demonstration, except to a few trusted journalists, because if state security forces had known about it before hand it would have been forcefully dispersed and we wouldn't have a chance to get our message across." The International Day in Support of Victims of Torture is commemorated each year on June 26 as the UN's International Convention Against Torture and Other Cruel, Inhuman or Degrading Treatment or Punishment came into force on this day in 1987. There are a total of 141 state parties to this international convention. The Egyptian government ratified the convention on June 25, 1986 and has entered no reservations on any of the provisions contained within the convention. UPDATE: Nora Younis posted some photos of today's demo. And here are more pix, by 3amr 3abdallah of Al-Masri Al-Youm.